This card was inspired by the same photo on Pinterest as yesterday's Valentine. I'm giving this one to my sister, the vet, whose birthday is fast approaching. The Happy Birthday dies are from The Stamps of Life, the balloon is from Paper Smooches and the 'string' is a stem from the MFT Fresh Cut Flowers dies. And oh yes, my favourite pierced rectangles from MFT. Love the pierced mats! The sentiment die is awesome too. I might "need" to do a little retail therapy! Love, love, love your style Ardyth and this one simply popped off my screen and shouted come on over and take a closer look! You should link this up at Less is More where it's a colour challenge with lots of birthday goodies! Colours are pink and grey. Your CASology one would do good too! Gorgeous pristine perfection! You sure know how to work those dies! Okay...decision made...the pierced mats will be ordered today! You are such an enabler! Your color combo is FABULOUS! 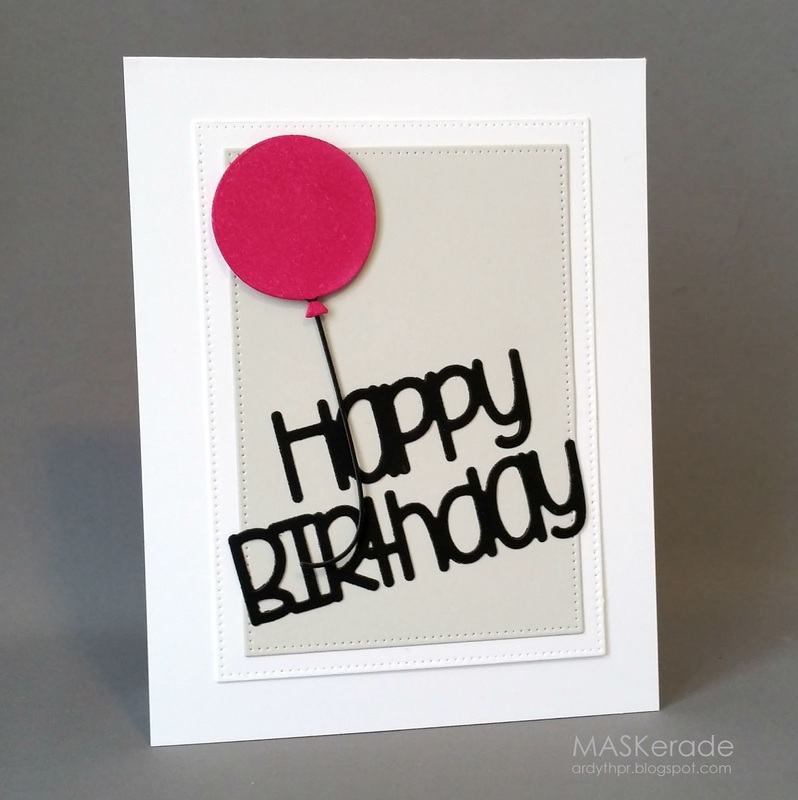 The soft stone grey/beige with the bright pink balloon and bold black sentiment is an incredibly effective mix! Love it. Fabulous card...just fabulous! And I love that you used your pierced dies, love the look they give your card.